The Local Organising Committee (LOC) of the Niyi Osundare at 60 Socio-literary fete 2007 in Africa, Europe and North America hereby announces the programme of events to celebrate one of Africa’s finest and prolific voices in poetry and literary scholarship, Professor Niyi Osundare, born March 12, 1947. Niyi Osundare gained degrees at the University of Ibadan (BA), the University of Leeds (MA) and York University, Canada (PhD, 1979). Previously professor (from 1989) and Head of English (1993-1997) at the University of Ibadan, he became professor of English at the University of New Orleans in 1997. The Niyi Osundare at 60 Literary fete 2007 tagged Eye of the Earth will take place in venues in Ibadan, Ikere Ekiti, and Lagos state of Nigeria between Saturday 10th March 2007 and Wednesday 14th March 2007. For the Local Organising Committee. 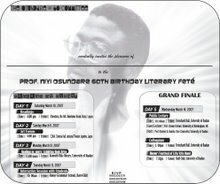 Homepage of the 60th Birthday Literary feté in honour of one of Africa's finest poets, Niyi Osundare. This blog will be updated as necessary.